Yes, fellow readers, Loomis makes every taste explode in your mind just as it does in her mouth. She delivers us to the places where she loves to shop, shares her secrets for making soups, salads, pastries, and more, and she writes a love note to the people in her adopted land. As an expat American, she also shares a wonderful list of sources to help Americans find the best ingredients, spices, and even wines. My husband and I spent several days in Normandy a few years ago and now I’m trying to figure out how I might convince him that we need to return if only to visit Louviers, the town where Loomis and her patisseries and boulangeries reside. I also plan to read On Rue Tatin, Loomis’s previous memoir, and to visit her website often to find new recipes like this one with a video on making the perfect salad. Summing it Up: If you love to cook, read this book. If you don’t care one iota about cooking, read this book for the sheer joy of Loomis’s life in her small French village. If you long to visit France, read this book for it will make you feel as if you’ve been there. Just read this book and give it to someone you love who loves life, recipes, and travel. Note: if you’ll be near Washington, D.C., Los Angeles, or the Pacific Northwest in July and August, you may be able to catch Loomis at her book tour events some of which include cooking demonstrations. Whatever you give your father or grandfather for Father’s Day, it will be just what he wants because he loves you and thinks almost everything you do is perfect. Even when you made him a clay hippopotamus that resembled a piano, he loved it and displayed it. Still you’d like to give him something more personal than golf balls or a tie and you may be a little old to make him a clay paperweight so buy him a book that fits his interests. Contact your local independent bookstore and they'll even help Dad download one of these titles onto his Ipad or e-reader or they'll help you find just what he wants. 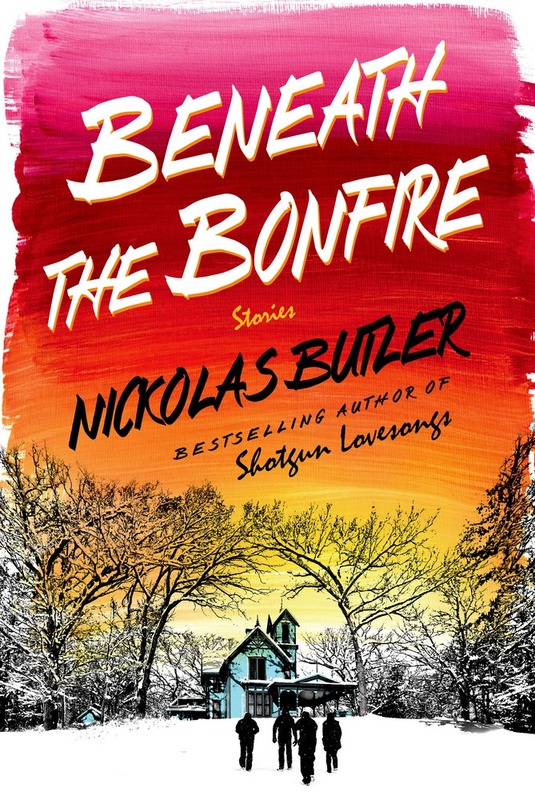 If your dad is happiest when camping, hunting, or fishing yet he’s also a reader who appreciates fine writing then Nickolas Butler’s Beneath the Bonfire will make him smile more than a Cabela’s gift card. It’s a testosterone packed group of stories that puts the reader alongside the men camping out, the couples at a chainsaw party, and those hunting prized morel mushrooms. This is the rare treasure that celebrates male bonding without trivializing it. If your dad missed Butler’s amazing debut novel, Shotgun Lovesongs, it’s out in paper and would also be a fine present, especially for Gen X or Millennial Dads. My husband recently finished Erik Larson’s Dead Wake: The Last Crossing of the Lusitania and he highly recommends it for other Dads. We all know what happened on that 1915 journey when a German U-boat sank the Lusitania, but Larson’s skill is in making what we know exciting by showing us history through the people who made it. Larson paints a picture using letters, telegrams, logs, and the statements of survivors that’s historically accurate, informative, and intriguing. Dear Father: Breaking the Cycle of Pain by J Ivy is a book younger fathers will want to read to learn how the Grammy-winning hip-hop poet forgave his absent father and started a program to help inspire healing through writing for children and adults who grew up in fatherless homes. Read my full review here. The Secret Wisdom of the Earth by Christopher Scotton shows how a grandfather’s love can heal. Fourteen-year-old Kevin’s brother is dead and his mother “had folded into herself” so they go to her Kentucky hometown where her father, “Pops,” works to save them. The Secret Wisdom of the Earth will have your father holding his breath as he hikes down the mountain alongside these authentic characters. It’s a debut novel that's simply an old-fashioned good read. Read my full review here. 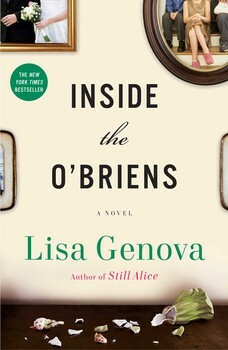 Inside the O'Briens by Lisa Genova celebrates fatherhood even when it's tough. Give it to a father who likes a great story. It will make you remember that "Every breath is a risk. Love is why we breathe." Read my full review here. "Elsa is seven, going on eight. She knows she isn’t especially good at being seven. . . . Adults describe her as “very grown-up for her age.” Elsa knows this is just another way of saying “massively annoying for her age,” because they only tend to say this when she corrects them for mispronouncing “déjà vu” or for not being able to tell the difference between “me” and “I” at the end of a sentence. Smart-asses usually can’t, hence the “grown-up for her age” comment, generally said with a restrained smile at her parents. As if she has a mental impairment, as if Elsa has shown them up by not being totally thick just because she’s seven. And that’s why she doesn’t have any friends except Granny. . .
Granny is seventy-seven years old, going on seventy-eight. She’s not very good at it either. You can tell she’s old because her face looks like newspaper stuffed into wet shoes, but no one ever accuses Granny of being grown-up for her age. “Perky,” people sometimes say to Elsa’s mum, looking either fairly worried or fairly angry as Mum sighs and asks how much she owes for the damages. Or when Granny’s smoking at the hospital sets the fire alarm off and she starts ranting and raving about how “everything has to be so bloody politically correct these days!” when the security guards make her extinguish her cigarette. . . .
She used to be a doctor, and she won prizes and journalists wrote articles about her and she went to all the most terrible places in the world when everyone else was getting out. She saved lives and fought evil everywhere on earth. . . . But one day someone decided she was too old to save lives." Elsa’s life was complete even though she had no peers, but then Granny died. That meant an end not only to their friendship but also to the tales Granny told about the Land-of-Almost-Awake and the Kingdom of Miamas that paralleled the lives of the people in their apartment building. It also meant that Elsa had an assignment; she was to deliver Granny’s letters of apology to the building’s residents via clues to where to find each letter. In the midst of her grief, Elsa must enlist the assistance of an extremely large, very shy, germ-fearing neighbor known as The Monster, a giant dog, and a cast of unusual neighbors. Elsa must also manage her fears about what life will bring when her workaholic, pregnant mother gives birth. With multiple subplots and eccentric characters galore, the reader can get lost but Backman faithfully steers the book back to the essentials. Elsa and her companions remind us that stories and our connections to each other matter even when adults are too busy and too self-involved to notice and that grieving isn’t easy. Summing it Up: Read this fanciful tale to remind yourself that stories matter, that children often see what’s important and that a little suspension of belief can be good for the soul. 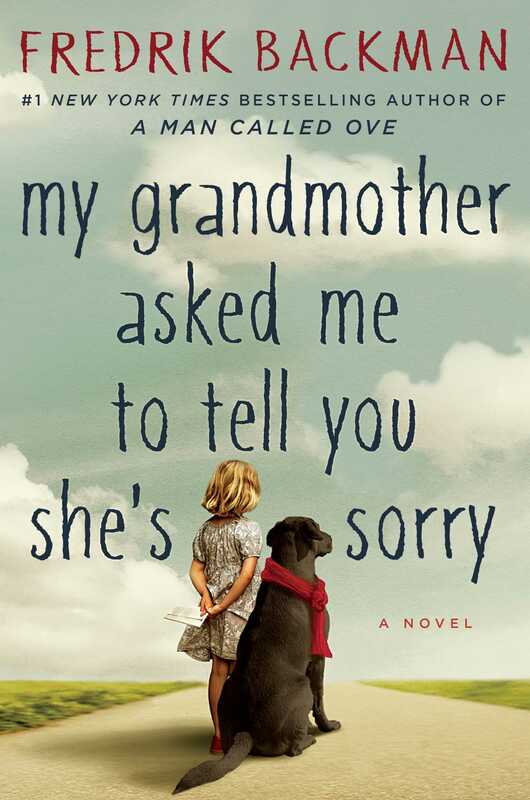 Read it to slip into Elsa and Granny’s world where charm and tenderness triumph over cynicism and grief. Read it because a book doesn’t have to be perfect to touch your heart. You're Hungry for Good Books! This doesn't include my views so this little blog I started a few years ago to share my love of books is growing. It started with my friends and the libraries and groups I spoke to sharing the link. Authors and independent bookstores now share it. Thanks for reading and sharing your favorite books. The Truth According to Us is a clever romp tied together by secrets and more secrets seen primarily through12-year-old Willa Romeyn’s eyes as she views her family in their small 1938 West Virginia town. 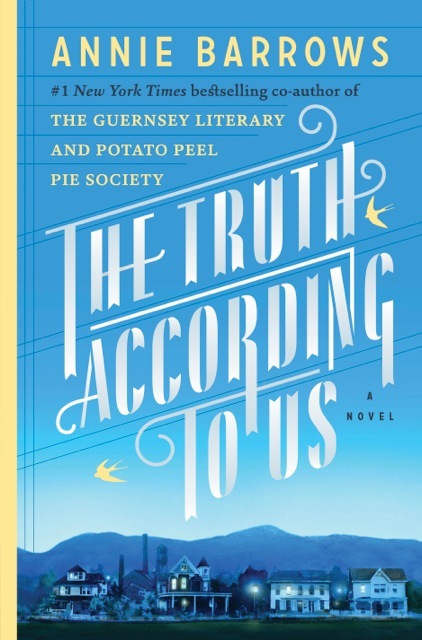 Author Annie Barrows worked with her dying aunt to complete and co-author The Guernsey Literary and Potato Peel Pie Society and is the sole author of the Ivy Bean children’s series.This is Barrow’s first adult novel since she co-authored “Guernsey.” The Truth According to Us and “Guernsey” are both period pieces and both feature epistolary aspects with letters telling some of their stories. The book begins when a glamorous city girl, Miss Layla Beck, moves into the Romeyn home as a boarder to write the town’s history for the Federal Writers’ Project in order to escape marriage to a man her prominent Senator father has chosen for her. She isn’t happy about writing about “a town full of toothless old hicks” but soon learns many stories including one about the mysterious 1920 death of Vause Hamilton who died in a fire he allegedly set at the local sock factory 18 years previously. The fire, the factory, the death, and other secrets have deep connections to the Romeyn family. Jottie Romeyn loved Vause and isn’t over his death nor is her brother Felix who was Vause’s best friend. Sol McKubin, the current plant manager, thinks Felix was involved in the fire and people in the town don’t trust Felix and his frequent disappearances. Young Willa, Felix’s daughter, is intrigued by Layla until a romance buds between Layla and Felix. Layla’s witty letters to her family help the reader understand the town and the times as well as offering relief from the linear telling of the town’s history and secrets. Summing it Up: This is an appealing tale for readers who enjoy historical fiction, women’s stories, and a touch of romance. Lovers of The Guernsey Literary and Potato Peel Pie Society will enjoy the setting, the way families protect each other, and the tensions caused by the romantic entanglements.